The Dolby Atmos track is truly where Smurfs: The Lost Village shines. Audio moves effortlessly from one speaker to another and travels throughout the room. It really feels like you are transported into the audio-visual space of the Smurfs. Smurfs, those lovable blue creatures created by Belgian comics artist Peyo, are back on the silver screen again. This time in Smurfs: The Lost Village we meet an entirely new colony Smurfs. Gone is the live action/cg hybrid that graced the first two films. This time we are thankfully immersed totally in the world of CG and the Smurfs. Every Smurf has a lot in life, whether it be being "Nosey", or "Jokey" or "Brainy". Every Smurf knows their role in Smurf Village…except for Smurfette. See she was not born into the world a normal Smurf is. She was brought to life by the evil wizard Gargamel to help track down Smurfs and was only made "real" by Papa Smurfs magic. One day while going through the forest Smurfette finds a Smurf she is not familiar with. She accidentally alerts Gargamel to the new discovery so she must mount a daring trek across uncharted lands with the help of Hefty, Brainy and Clumsy to alert these new Smurfs to the dangers of Gargamel. What they find on their trip will change the history of the Smurfs forever. While the first two Smurf films never really clicked with me this one hits the mark. Gone are the horrible goofy antics of live action film (especially those by Gargamel played by Hank Azaria (Godzilla) as well as the simplistic comedic plot. They are replaced by a heartwarming story about growing up and accepting who you are in society. To help flesh out this tale an amazing cast of actors were brought in including Demi Lovato (Camp Rock), Joe Manganiello (True Blood), Danny Pudi (Community), Rainn Wilson (The Office), Jack McBrayer (Wreck-It Ralph), Mandy Patinkin (Homeland), and Julia Roberts (Pretty Woman). 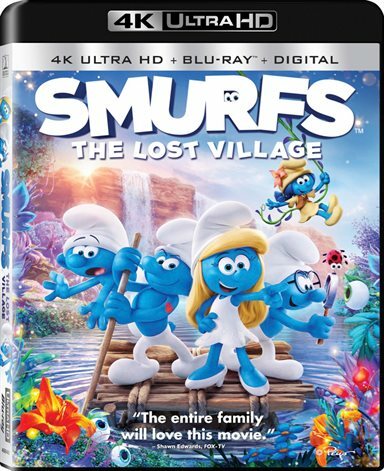 With Smurfs: The Lost Village being rendered only in 2K, the 4K UHD resolution is not the big of a bump over the traditional Blu-ray version. There is a bit of extra sharpness over the 1080p version, but not enough to make that much of a difference. The true difference is in the UHD color quality versus the regular Blu-ray. With UHD one can see the world of The Smurfs the way Sony Pictures Animation intended it to be. Colors cover the full spectrum that the 1080p Blu-ray only displays a fraction of. The Dolby Atmos track is truly where this disc shines. The soundtrack provides a very wide field. Audio moves effortlessly from one speaker to another and travels throughout the room. It really feels like you are transported into the audio-visual space of the Smurfs and their respective villages. Demi Lovato Meets Smurfette - Smurfette essentially talks to herself. Smurfify Your Nails - Learn how to paint up your nails in Smurfy ways. Baker Smurf's Mini Kitchen - Baker Smurf watches some Smurfalious treats being made. The Sounds of the Smurfs - A look into how the audio elements of the film enhanced the visuals. Draw your Favorite Smurf - Learn how to draw your favorite Smurf in quick easy steps. While Sony and Peyo might have missed the mark with the first two Smurfs films this one is closer to the Saturday morning television show we loved. It has great visual, amazing audio, a heartfelt story, and it is truly a wonderful trip to take. Sony Entertainment has released a great set for all lovers of Smurfs so they may enjoy their "smurfiness" for years to come. Download Smurfs: The Lost Village from the iTunes Store in Digial HD. For more information about Smurfs: The Lost Village visit the FlickDirect Movie Database.